OPTION 1.- GROUND FLOOR: 3 double bedrooms, 2 bathrooms, (maximum 6 people) ,fully furnished and equipped kitchen, living room with fireplace, jacuzzi; Good ventilation, natural and sunny lighting. Air conditioning hot / cold, ceiling fans and gas heating; Exclusive use of terrace, pool, garden and its furniture (table, chairs, hammock, deckchairs, barbecue); Parking for 1 car. FOR CYCLISTS: Covered and closed space to store bicycles and their suitcases. OPTION 2.- GROUND FLOOR + UPPER FLOOR: With supplement, it is the 4th room (Suite type) Maximum 2 additional people. You will enjoy OPTION 1 plus the Suite located on the upper floor of the house, it has: a living room, a double bedroom, bathroom, terrace with mountain views, desk, furniture bar, fridge, coffee maker and microwave; Ventilated, natural lighting, sunny, ceiling fans and air conditioning hot / cold. Interior and exterior access; Option 2 (Suite) is NOT rented to other guests apart from option 1. To know the supplement / day of this option 2, indicate on the website 7 or 8 guests. I am calm, loving the natural life, in the pursuit of happiness through simple pleasures. This philosophy of life is not new and was preached by Epicurus of Samos in the fourth century AD . ; In homage to him I named my house with which his was known in Athens. 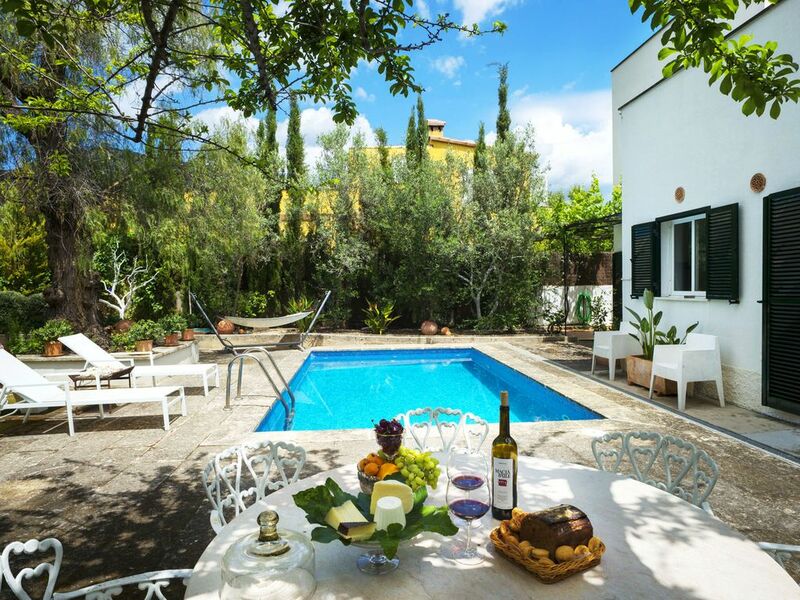 The intimate garden where you can enjoy the pool on sunny days, dinners on the terrace with dim lighting, a comfortable and equipped environment inside makes you feel at home and share the happiness of good times in the company of your family or friends. The fountains with their whisper of water (one of them gift of the Havana Historian, located under the fig tree in homage to the tale "the Alchemist" of Paulo Coelho), to enjoy a hammam or the fireplace in winter make the place pleasant And sensual. Nofre was an excellent host. He was very welcoming and nice. The home is beautiful decorated. Very nice beds and high quality linens and towels. Nofre had fresh fruit and champagne for our arrival. The courtyard and pool were beautifully attended to with lovely flowers. I highly recommend this home. It is also set in a perfect area for cycling the western side of the island. Thank you Nofre for sharing your home with us. I hope you had a nice return back home. Thank you very much for your comments, it was a pleasure to welcome you at home, You are always welcome. And as you say in the United States, if you liked tell a friend. We stayed at Jardin Epicur for the first 10 days of the school holidays. What did we do - absolutely nothing except for relaxing by the pool and then dipping in when it got too hot! We loved sitting out in the evening and eating our dinner. A wonderful, relaxing holiday. Nofre is the perfect host and gave us a great tip about where to get the best paella - which we did. The house is clean and tidy. Nofre has a wonderful selection of art on the walls and everything you could need is there. No complaints at all and we look forward to a return visit in the future. Highly recommended. The house and especially the grounds are even nicer than the pictures would suggest. The house was clean and well presented and the kitchen was excellently furnished for cooking and eating-in for our group that maxed at 4, but would certainly accommodate more. The trees, vines on the exterior property wall, and, location on a quiet residential street on the edge of town provided plenty of privacy while enjoying the pool and garden. The owner was very conscientious about ensuring that our stay went without problems and though he lives in an entirely separate apartment above the rental (separate entrances, no open access between the 2 units) he was away most days and always ensured that he provided us with all the privacy that we would want/need. As we were in Mallorca for road cycling with our own bicycles there were no issues keeping the bicycles secure in the rental during our stay. The property is well located for cycling with easy access to the medium mountains of the Tramuntana or the flatter plains of the island interior. The central shopping street of Palmanyola is only a 300m walk away and had almost all of the necessities (groceries, patisserie, butcher, fruit stand, pharmacy etc.) for our stay. A dripping tap in the kitchen is all that we could think to complain about and the owner is aware and promised to correct for the next guests. A wonderful stay. We would highly recommend and would rent again the next time that we are in Mallorca. Thank you Nofre! Thank you very much M+M. It was very nice to have you as guests for a month and I hope to have fulfilled your expectations and I take into consideration your comments, you will always be welcome. Schöne Finca, wo es einem an nichts fehlt. Der Vermieter Nofre ist sehr nett und hilfsbereit. Haben gleich die Finca nochmal gebucht. Palmanyola ist ein ruhiger Ort ,aber nur 8 km von Palma ,ca.15 min, entfernt. Das Haus liegt an einem Pinienwäldchen, ideal für Jogger und Wallet.Auto unbedingt erforderlich. Das Haus bietet samt Garten alles , was man braucht , um einen schönen Urlaub zu verbringen und der Vermieter Notre ist sehr hilfsbereit, freundlich und nett. Wir haben uns wohl gefühlt. Toll war, dass wir unsere zwei kleinen Hunde mitbringen durften. Der liebevoll gestaltete Garten und die individuell und geschmackvoll gestalteten Räume gefielen uns von Beginn an. Uns fehlte es in den fast 3 Wochen an nichts. Auch der nette Empfang und die Rundumbetreuung durch Nofre, unseren Vermieter, trugen zu einem wunderbaren Urlaub in diesem Hause bei. Es war ein Wohlfühl-Erlebnis in absolut ruhiger Umgebung und herrlicher Natur, abseits vom Touristenrummel. Das Haus ist von der Lage ideal, bis Palma, Valdemossa oder auch Soller ist man in 15 Autominuten. Nofre, gracias por su hospitalidad y nosotros volveremos con placer. Your stay was very pleasant, I appreciate the interest you showed for Mallorca and its culture and also the day we had dinner together and the wines we had together. Clients like you are those who give meaning to the "Jardin de Epicuro". At 800 mts of Son Termes golf course 18 holes and Son Amar (show room).